Every family has its secrets. Some are small, like telling a white lie or snooping through a private drawer. Others are more serious like infidelity and betrayal. And some secrets are so terrible they must be hidden away in a deep, dark place, for if they ever came to light, they would surely tear a family apart. The Tides are a family full of secrets. Returning to Clifftops, the rambling family house high up on the Dorset coastline, youngest daughter Dora hopes for a fresh start, for herself and the new life she carries. But can long-held secrets ever really be forgiven? And even if you can forgive, can you ever really learn to love again? Every family has secrets, some are small like telling a white lie or snooping where your not supposed to. Others are more serious like an affair or betrayal. Then there are secrets that are so terrible that no one must ever ever find out for fear that it will tear a family apart. The Tide is such a family full of secrets. When Dora finds out that she is pregnant, it forces her to confront her past. Returning to Clifftops in Dorset she goes to unlock the secrets of her troubled sister Cassie that she swore she would take to the grave. But can a secret so terrible really be forgiven and will the Tides ever learn to love one another again? What a beautiful cover this book has! I found it extremely enticing and I just had to pick it up! And little do you know what gut wrenching story is hidden beneath this beautiful cover. 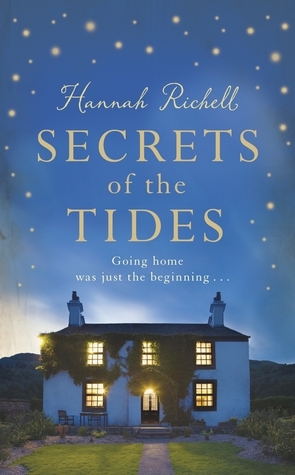 I read The Secrets of the Tides as the end of last year and thoroughly enjoyed it! This was truly one of the best debut novels I have ever read! It gripped me right from the start with a prologue set to keep you guessing. This is a vivid, compelling family saga detailing the complex relationships they all have with one another and themselves. I liked the way it kept moving between the past and the present as it keeps you guessing as to what happened and why things have turned out to be like they are. The past is in the view of Dora’s Mother Helen and the present day focuses on Dora. It is through this brilliant third person narrative that we are able to decipher the Tide family structure and read as their characters come alive through story. The tension in this story is immense! Hannah Richell writes this incredibly well and I was physically tensing and praying that the events that were happening were not going to unfold badly. I thought she captured the grief and heartbreak of the characters extremely well. Richell explores the fragility of human feelings and how one mistake can tear a family apart. I desperately wanted to know what this terrible secret was that had torn them apart and left them so racked with guilt. Each character blaming themselves for their part in the tragedy and I wanted to know who was to blame and which character was it that threw themselves off the bridge in the prologue. This truly was an excellent debut that will draw you in and not let you go from the start. This story has stayed with me for a long time and if there weren’t thousands of other books that I want to read, I would definitely read it again. I am also thrilled that Hannah Richell has released her second novel ‘The Shadow Year’ which I will definitely be reading! My name is Laura and as you may have guessed, I am an avid reader. As is the case with all book lovers, I have had my nose in books since I was very little. My nan has picture of me when I was two pretending that I could actually read the words of a book. I live in the south of England and I work in London as a Marketing Executive, so when I’m not working I’m either reading, on twitter, or writing my blog. Next Post L.M Augustine week!! This sounds good. I shall have to look out for this and her second book. I enjoy books with complex characters and family drama! This sounds really interesting, will have to add it to my to-read list! Wow, sounds like a great book! I’m currently reading another family saga book called “Mofongo” by Cecilia Samartin, http://www.ceciliasamartin.com/, and it’s definitely worth checking out. I love the family saga genre and I’m always looking for new books to add to my TBR list, and “Secrets of the Tides” sounds like it’d be a perfect one to add!